In pictures: A file photo shows a young Obama swinging a baseball bat in Hawaii, while six-year-old Romney gets ready to hit one out of the park in Detroit. The US decides in November 6 between President Barack Obama and Republican Mitt Romney. 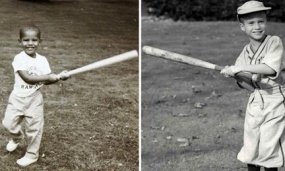 A file photo shows a young Obama swinging a baseball bat in Hawaii, while six-year-old Romney gets ready to hit one out of the park in Detroit. The US decides in November 6 between President Barack Obama and Republican Mitt Romney.